Content Mapping provides a clear and organized structure so you can plan, create and measure your content from a strategic level. This visual map technique helps you organize and understand how all your content interacts and determine what structure you need to support that marketing strategy. If the content is a fuel that drives a marketing strategy, then the content mapping is the headlight that allows you to see what your business must do to execute a successful content strategy. Many businesses understand the benefits of content and many business owners jump right into producing and distributing content. The only problem is that jumping right to producing content means they won’t be able to plan and structure their efforts if they don’t have a way to observe the workflow anticipate interactions between your content. This results in wasted time and money. 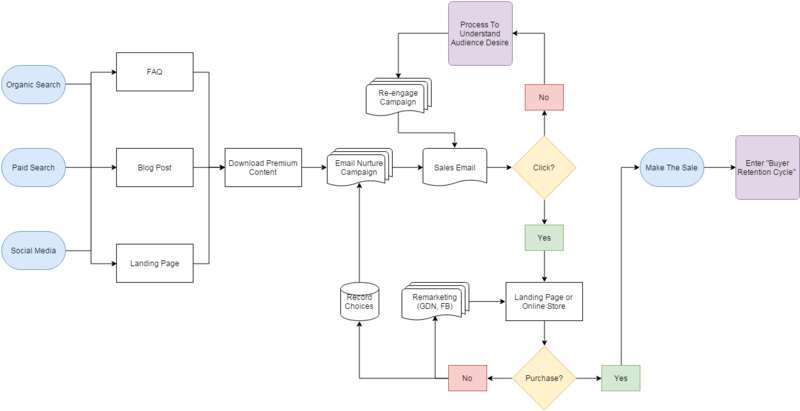 Let’s take a look at an example of a content map I created for a client. Please note that this is a pretty high-level view and does not show specific inter-workings of email campaigns, blog posts, etc. Why Should You Use Content Mapping? The only way to create content that captivates your audience is to produce high-quality content that creates an experience. Chefs know how to think through a dish preparation, what foods will be paired with each other, and how it will taste before anything hits the stove. Chefs take the time to imagine how each course will feel when their guests take the first bite. How the light sauce will pair with the chicken,and side dishes. The same kind of thoughtful approach must be taken when thinking about different pieces of content. A chef doesn’t throw a piece of chicken on a plate and call it a meal. They understand that the chicken and side dishes must work together to create an experience. That each piece of the course plays its part in the entire meal. The days of one-off content are over. Your customers are very picky, and your business needs to build a relationship to get the upper hand on your competition. A content map allows you to have a top-down view, so you can make better decisions on the fly, and prepare for future marketing initiatives. User Personas are tools that your business can use focus messaging for your audience. When you create a user persona, you are generalizing trends, characteristics, demographic information. This information helps you understand your audience on an intimate level. Always build out robust user personas before attempting to map your content. Now that you have some excellent user personas, you are ready to move on to looking at the client’s journey. The customer journey includes all stages that your audience goes through before they consider buying your product or service. Research options to fulfill their desired outcome(s). Able to discriminate amongst their options with a fair degree of certainty. Define their solution strategy or method to fulfill their needs. Informed about their options and focused on taking action. A detailed user persona allows you to drill-down the needs and expectations of your audience. Once you know who you are working with you can see where they are in the Customer Journey. This information helps you create a plan to produce quality content. 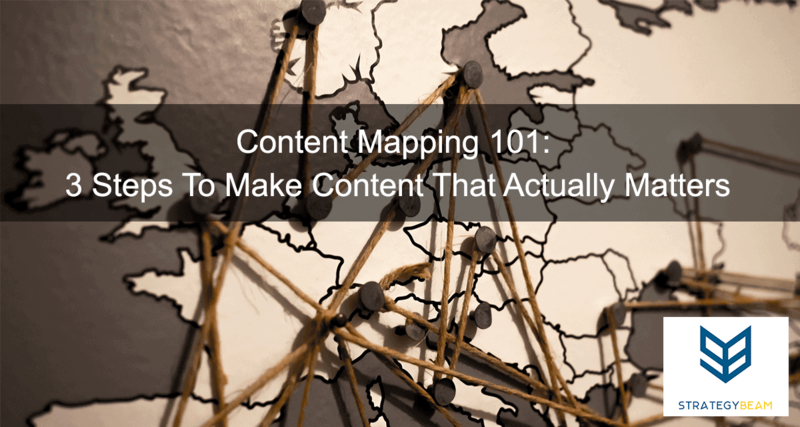 Content mapping allows you to create a lasting relationship with your audience. Regardless of the demographic, each goes through this process to arrive at the point of purchasing your product or service. Take time to work through the Customer Journey by mapping your content to align with the desires and expectations of your audience! If you want to get the most out of your content then you need to think through how the content will be used and consumed. Map your content to ensure that you can reach your audience and drive more sales today!